In Jilliand, Clare Gutierrez creates the perfect blend of war, romance, politics, and 9th century Viking and English culture. I really enjoyed reading Jilliand because it's so captivating from the setting to the characters. Jilliand's journey is filled with many hardships starting with an escape from her abusive father into a world so completely unknown to her. This story is so easy to sink into as Jilliand learns to survive and grow into a brave woman. 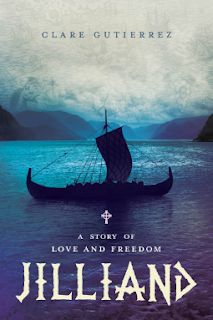 When her path crosses with Viking sea king Rurik, Jilliand faces an even greater challenge. She has to find a place among the fierce warriors who live harsh lives and worship different gods. Rurik and Jilliand are two completely different types of characters but they complement each other. I loved reading the story through each of their eyes and it made the story interesting and unpredictable. I never knew what would happen next in the story, but each new situation was a cause to read faster to see how Jilliand made out. The plot is full of ups and downs, which will appeal to the emotional side of readers. I like that nothing came easily for Jilliand, but she fought for the future anyway. She's one of those rare heroines that inspire hope and independence without a lot of second guessing or complaining. Jilliand is definitely a story for historical fiction readers, especially if you love the romantic aspect of the story, of course, for which I read greedily! It will be hard to leave this story when you've finished reading, and it will stick with you long after!